In his address at the CTIA Wireless 2009 conven­tion regarding the future of the wire­less industry, Verizon CEO Ivan Seidenberg made a compel­ling case that “500 percent pen­etration is not only possible, it’s probable.” Imagine a day when you not only own a smart phone, but also a wireless card in your laptop, a service such as On-Star for your car, an Amazon Kindle that downloads books on Sprint’s cellular network, and a wireless MP3 player on which you can download music. Oh, wait! That day is already here. We even already have lifesaving devices such as wireless heart monitors that transmit your vital signs to your doctor before a heart attack occurs. Actually, the advancements we will see in wireless health care go far beyond the medical e-records that President Obama promised as part of his push for health care reform. Donald Jones, an executive at Qualcomm and the chief wireless officer for the West Wireless Health Insti­tute, told attendees at a recent CommNexus meeting in San Di­ego that we can expect to see the “Kindleization of healthcare.” Essentially, that means that not only will we have remote moni­toring of all our medical condi­tions, but also we will even have wireless bandages, we’ll just push a wireless strip on the box when we are down to one bandage and a replacement box will be shipped to us. In other words, 4G is going to take wireless to an entirely new level. As Seiden­berg pointed out, the day when cellular networks will not only connect people to other people, but also connect people to ma­chines and machines to machines is upon us. And in our lifetime, we will see a house managed by wireless devices embedded in the HVAC, the oven and maybe even the toaster. So, it is not hard to imagine a world where each person has at least five wireless devices of some sort — thus, 500 percent penetration. Multiple devices per user means more cell sites — lots more. No wireless operator will want to be the company that lost a con­nection just as grandma’s vitals were being transmitted to the doctor’s office. But, these newer cell sites will be much different from the sites built for traditional voice service. 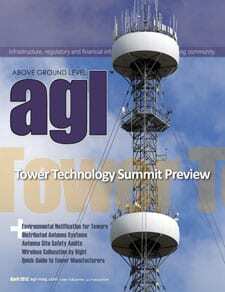 Cell sites for 1G and 2G networks were typically built for coverage, thus the tallest site available covered the great­est area. There weren’t as many subscribers, so capacity was not an issue. As penetration grew, however, fill-in sites with lower rad centers were built to increase the capacity of the network. As user needs develop and networks mature, RF designs tend to shift from coverage to capacity. Sites will be more subscriber focused, offering greater band­width, greater capacity and more flexibility. Currently, 3G and 4G technologies use various techniques to provide a tradeoff between capacity and range, so there are still a variety of high, low and inbetween sites. Tech­nology has enabled carriers to increase the range of their sites by reducing the throughput of the devices. Technology com­bined with subscriber demand for faster data rates is necessitat­ing the continuous building of more sites. In other words, with only voice technology, you either had connectivity or you didn’t, and everyone within range of the mountaintop site had cover­age. Now, as handsets evolve and subscribers expect greater data rates, sites are developed to support subscribers and are more capacity oriented. So, no single site is as important as it used to be. Although RF engineers avoid holes in coverage, the use of many more lower sites means smaller holes; thus, on average, individual sites are less critical. An analogy: If you have one car, it’s pretty valuable. With­out it, you can’t go anywhere. However, if you have a fleet of hundreds of cars, any particular car isn’t as valuable because you have others that can temporarily take up the slack if necessary. Watching penetration climb past 100 percent (as it already has in many European cities) does not necessarily translate into a corresponding increase in average revenue per user (ARPU) for network operators. The $100 per month we pay for unlimited plans for our smart phones does not include the card for your laptop, which is a separate $60. Sprint doesn’t charge for the Kindle access — it is included in the purchase price of the device when you buy it from Amazon.com. Medical devices will most likely work the same way. Con­sumers won’t be willing to pay extra for the ability to reorder supplies — that is a cost that will have to be covered by the seller. Wireless carriers still have to figure out pricing schemes for embedded wireless. And while we wait for those pricing models to take shape, we can be sure that 500 percent penetration does not mean a 500 percent increase in revenue for carriers — and it never will. In fact, for a multiple-device world to exist, devices and airtime must be cheaper — much cheaper. No one will pay $99.99 per month for a wireless link between their car and their microwave oven just to make sure their day-old pizza is warm precisely as they pull into the garage. It must be cost-effective to be attractive, and that means cell site tenants will continue to drive down costs to support their overall goal to reduce operating expenses to keep up with the cost of subscriber demands. And over time, the reality is that rent is the biggest carrier expense for a cell site. No one would question that needing more cell sites increases the demand for antenna loca­tions, and that is good for land­lords. But as previously men­tioned, the new sites are different and more flexible. So don’t expect to see as many tenants begging for the same location. Just as the handset has evolved, so has the cell site and, thus, the cell site lease. Generally speak­ing, multiple, tall, rooftop sites have replaced the mountaintop site, and lower rooftop sites are replacing tall rooftop sites, and lightpoles and femtocells are replacing lower rooftop sites. If every house gets a femtocell, the tall tower is much less vital to the tenant. For a carrier, the big benefit of femtocells is that they improve coverage and capacity while reducing capital and oper­ating expenses. If the cell site network comes down to the level of one site per house, carriers are not going to pay $1,800 per month for that site. As a matter of fact, carriers are not willing to pay anything for a femtocell in your house — they actually charge for that. As wireless innovation and growth become more deeply embedded in every facet of our daily lives, what does this mean for cell sites? Doesn’t rapid technological evolution mean the need for more sites, and won’t cell site owners expect to see more demand for access to their sites, thus increasing rents? Well, if all the new technologies operate on the exact same sites as existing equipment, yes. But that is not necessarily the case. There will be more telecommu­nications sites, no doubt about it, but the increased demand won’t necessarily be for the same types of sites. New sites will be smaller, with a lower rad center, and will require less square foot­age. For example, the equipment for a WiMAX network is much smaller than traditional cellular equipment, and a 4G network operator has much more flex­ibility about where that equip­ment is located. Thus, it is not reasonable to expect them to pay the same amount as a traditional voice carrier would pay to have its antennas 150 to 200 feet in the air. A 4G network operator’s antenna array is smaller and lighter, and the 4G base station is not much different in size from one of my wife’s suitcases. The dynamics between cell site landlords and tenants are chang­ing. Cellular operators are look­ing for long-term partnerships with their thousands of land­lords. Landlords would do well to treat their tenants like partners and customers with a long-term view in mind — which is simply prudent business.